Good consistent with age, some patches of discolouration but legible throughout. Parchment : 2 sheets 76cm x 60cm with 1 wax seal, signature and revenue stamps. Schedule. 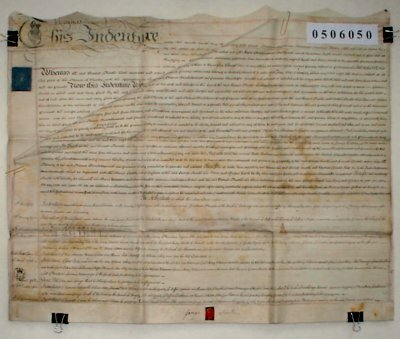 There is a schedule listing 9 earlier indentures relating to the property made between 1748 and 1764, The name of George Smith first appears in the list in 1764.